Customers can buy STARDUST Spill Products™ factory-direct and receive free shipping. Clearly, the marketplace has demanded eCommerce shopping and purchasing options for our goods, and Paradigm International has responded. Paradigm International, Inc. has announced the launch of its new eCommerce website. The website allows customers to buy the company’s entire STARDUST Spill Products™ line factory-direct and with free shipping. The products were developed to answer the universal problems of spill containment, spill control, and spill clean up. The need for this family of products exists because every day, in an endless array of facilities, billions of gallons of liquids are used and moved from one place to another. During this process, spills inevitably occur. 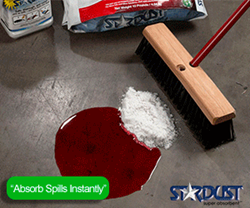 Whether they are hazardous and disruptive, or merely an inconvenient nuisance, STARDUST Spill Products™ solve spill problems by containing and easily absorbing the spill, regardless of the size. STARDUST Spill Products™ are environmentally safe and friendly, non-toxic, non-reactive, non-flammable and inert. They will not harm humans, plants or animals. Paradigm’s STARDUST Super Absorbent™ and STARPOWER Super Cleaner / Degreaser™ are also USDA approved for use in food processing facilities. The STARDUST line differs from other solutions that have proven to be cumbersome, inadequate, time consuming, and very expensive. The products are easy to use, efficient, and cost effective. Paradigm International, Inc. was formed in 1993 to provide an innovative answer to a universal problem: spills. From its original flagship product, STARDUST Super Absorbent™, the product line has been expanded to include more than 120 items in five categories: loose absorbents, spill kits, sorbents (pads, rolls, socks, booms, and pillows), shop rags, and its second flagship product, STARPOWER Super Cleaner / Degreaser. Its goods are shipped from locations in California, Illinois, and Tennessee. The company is a certified Minority Business Enterprise.